Glad you like it! One thing to consider if wanting to make a toy hauler is getting your motor sports (bike, atv?) up into the trailer. The M116A3 platform is something like 28" off the ground (and that's with 32's, not the Military 37's that it came with), so you'd need a long ramp of some kind to get them up and in. But I have thought that a similar body style could be built on a lower civilian frame. Or you can get creative with a back door that doubles as a ramp, or bench tops that are removable and become ramps when repositioned... The best thing is if you can imagine it, you can build it. Tow vehicle: 2008 Jeep Liberty with a 4 inch lift. lfhoward wrote: The trailer I bought at government auction, it turns out, is parked in a highly secure installation in Virginia. That means I need security clearance to go pick it up, which puts project on pause for another week. Next step is a criminal background check! It went fine. I had the trailer inspected today (required in PA) and was surprised that I've owned it now for nearly 2.5 years! The trailer has held up well to the weather and frequent use. Those military trailers are tough, and so the part I built on top of it has fared well too. Of course a trailer like this is never "done" so there is a list of "to-do's" waiting for a sunny day that coincides with some free hours to work on it. 3. Needs new bearings, races, and seals. It won't pass inspection without the brakes and bearings. 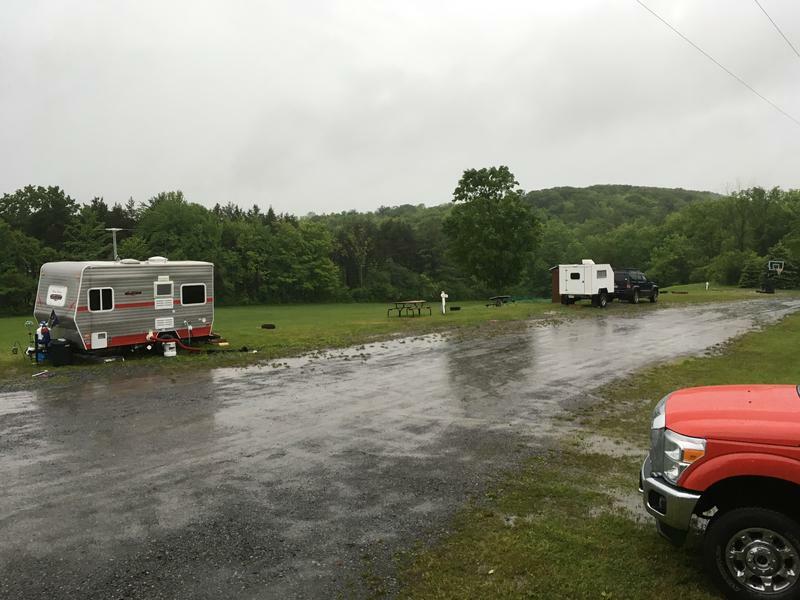 I'm a bit bummed as I was hoping to get up to the Poconos for some camping in a couple of weekends, but it's good to know what needs to be done to keep it safe and reliable on the road. 4. Finish putting up the cedar interior walls and the birch ceiling. 5. Cut out interlocking gym mats to fit the floor and act as insulation. 6. Install window caps, door stop/brace, and new edge molding inserts. 7. Cut out and install side cargo doors that were in the original plan, but covered over by aluminum skin because of needing to have it campable in time for last summer's 7 week trip. I have a number of other ideas for improvements too, but these will do for now. I noticed that none of my photos of the build show up anymore, thanks to Photobucket's scheme to charge us $399 a year for the right to post images on forums. I made a PostImages.org account to take its place, but I haven't had the time yet to go back and fix all the IMG links in my old posts. If anyone reading this would like to see a particular photo from any point in the build, let me know. Last edited by lfhoward on Sun May 13, 2018 3:18 pm, edited 1 time in total. Today I was able to get back to my trailer project! 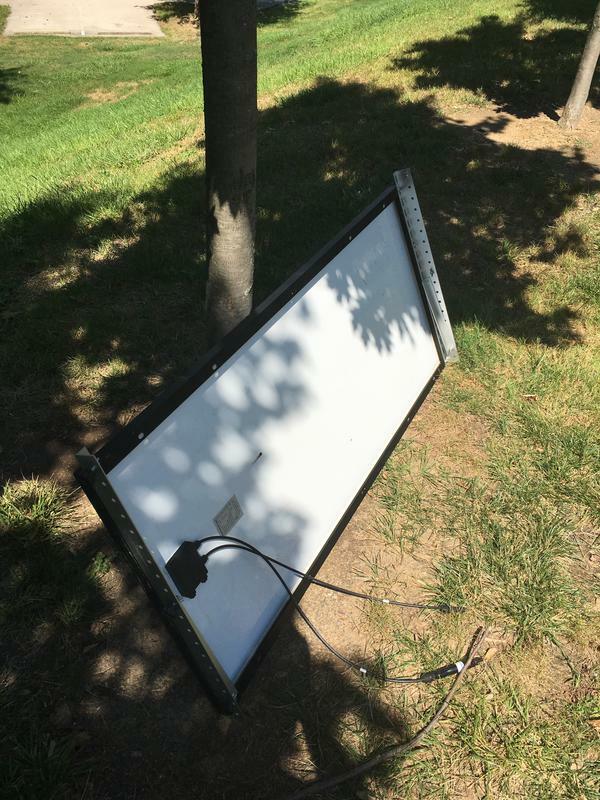 Goal: install solar panel. 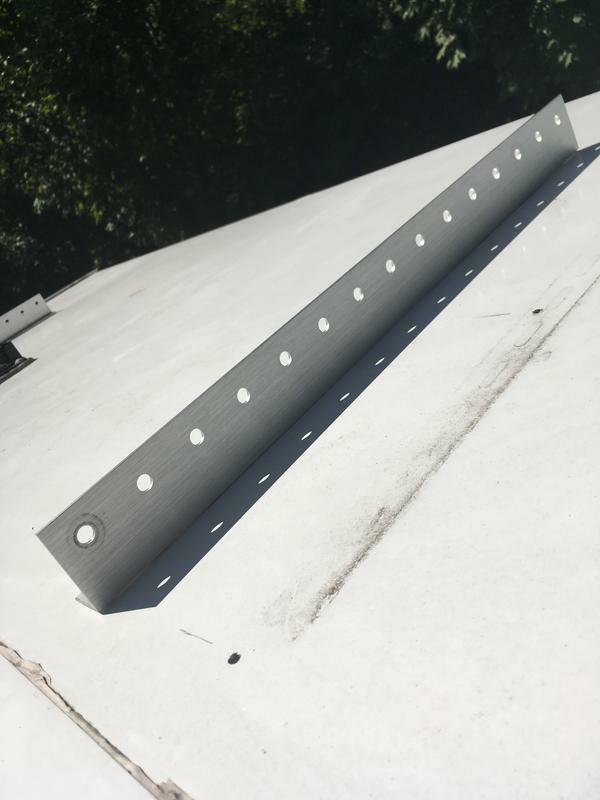 Drilled holes in a perfectly good roof! I measured each hole at least 4 times so it's all good. The panel can tilt forward if parked facing south. Last edited by lfhoward on Sun May 13, 2018 3:19 pm, edited 1 time in total. Great pictures. Thanks. 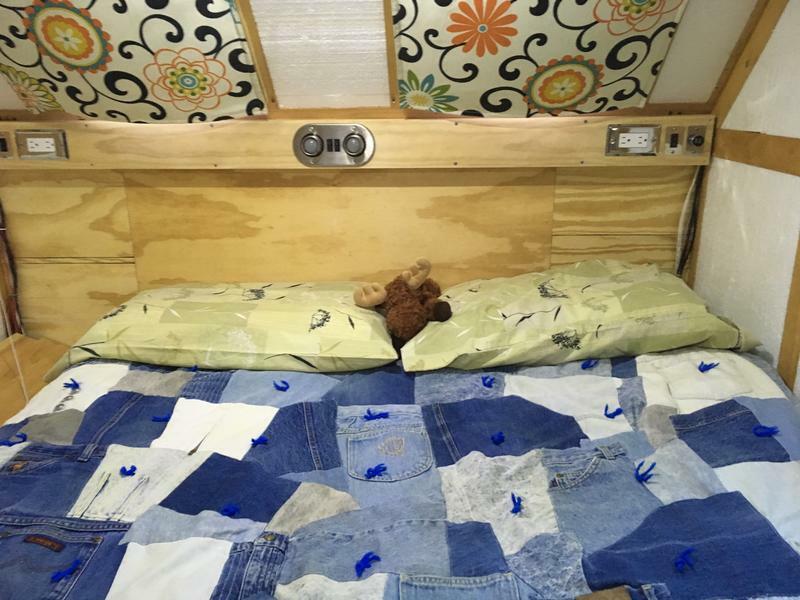 Love the denim quilt and the cloth panels above it. Adds a lot of color and interest. 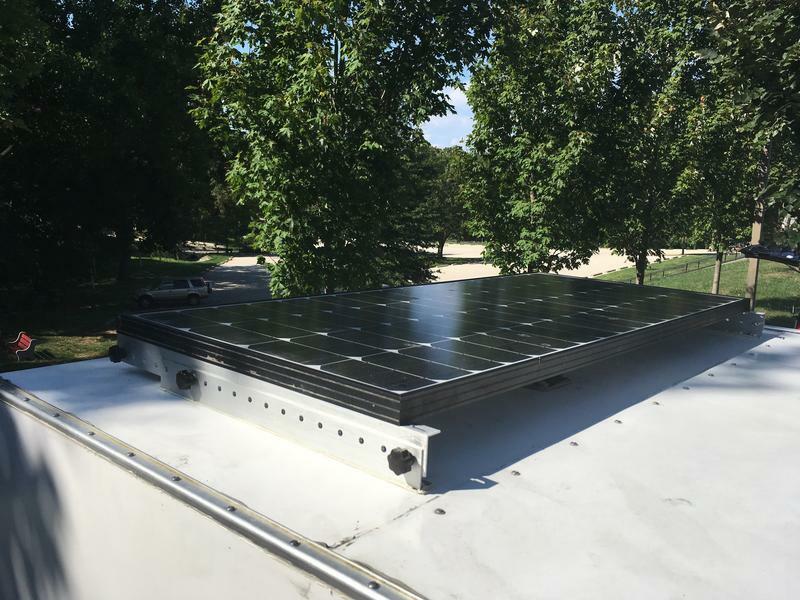 Looks like you're still finding things to do to make your camp experiences even better, including the new solar setup! Thanks for following, Sharon. My family moved over the summer so it's nice to get back to tinkering. I might have a few hours on Friday afternoon to spend on it. First and most importantly, I want to remove all the exterior screws, shoot Sikaflex into the holes, and reinstall. I did that on one side back in the spring. Three sides to go, and a roof! If I have time, you'll see aluminum window caps and a doorstop/ door holder as well! Great camping pics! Trailer looks warm and comfy! Thanks! 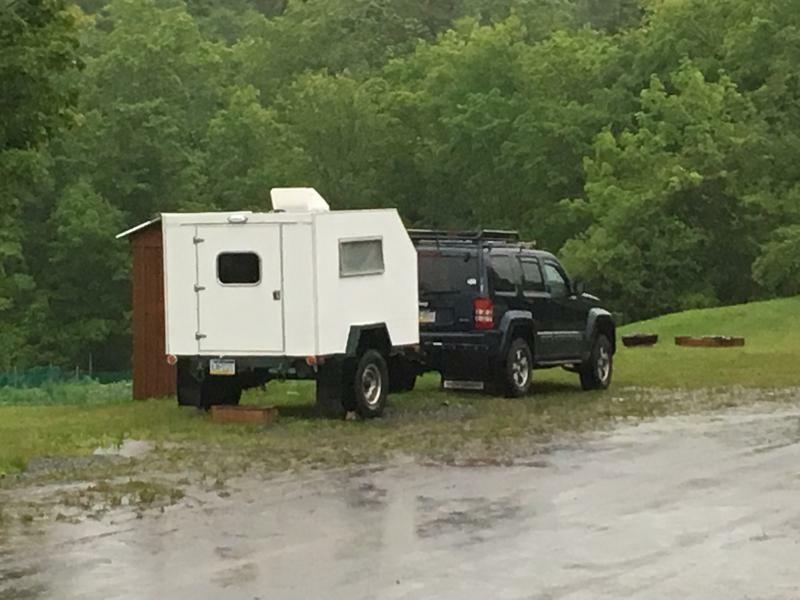 It is a nice little home on wheels and can be pretty comfy when it's rainy and cold outside. I checked inside under the solar panel and am happy to report no leaks from today's rainstorm. Also, the batteries are back up to 13.1 volts, having slowly gone down to 12.3 since their last charge in June. The solar panel will maintain them from now on, and the only reason shore power would ever be needed is to run the heater. Quick question for battery geeks: I have "no maintenance" marine deep cycle batteries. What are the chances I need to check the water level in the cells? I got them in 2015.
lfhoward wrote: Quick question for battery geeks: I have "no maintenance" marine deep cycle batteries. What are the chances I need to check the water level in the cells? I got them in 2015. Why not just pop off the caps now and look at the water level … then let us know the answer? Well, I just ordered new Timken bearings and races, and some new brake parts. Looking forward to getting the M116A3 back on the road again and camping again. The trailer had failed inspection back in September due to water corroding the bearings (rusty axle grease!) and non-functional brakes. Fascinating build. I've often thought of using one of those trailers. Interested in the brake/axle rebuild. HarleyCamper wrote: Fascinating build. I've often thought of using one of those trailers. Interested in the brake/axle rebuild. Thanks! I’ll definitely post details of the install when I can get to it. 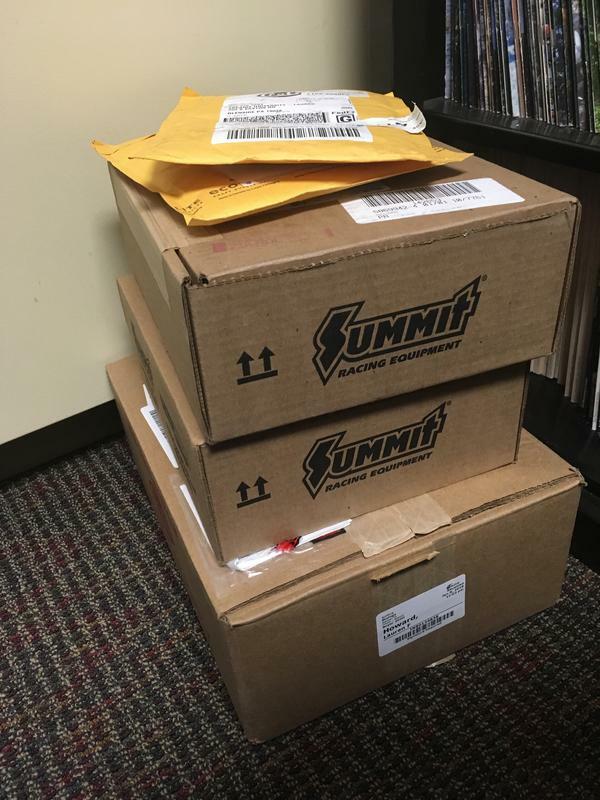 I have this stack of parts waiting to go but time is super hard to come by during the academic year (am a biology professor). Things are a bit more flexible in the summer when I am working on research instead of teaching full time. 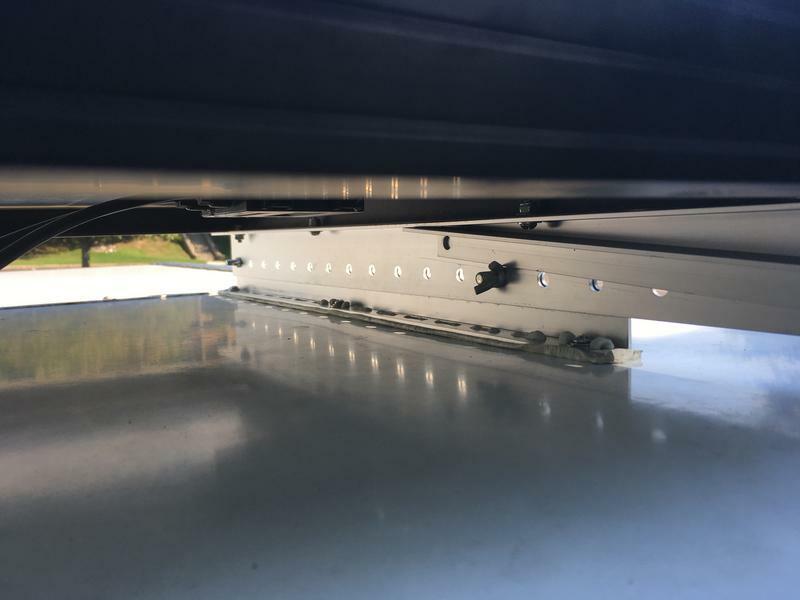 Many of the military trailer builds I see here and on expeditionportal have stripped off the surge brakes, parking brakes, and military axle/suspension and replaced them with something lighter. I can see the logic there, but I want to keep mine as much as possible to the original specifications. About the only things different about my chassis is that I installed running lights, changed the brake bulbs from 24V to 12V, and stepped the tires down from 37’s to 32’s. Otherwise it is an M116A3 generator hauler. These new parts I ordered will get the surge brakes and 1.5 ton axle back in working order. Spring is finally here in Philadelphia and summer will soon be here for those of us who are educators! That’s not to say there is no work to do, but I do have a lot more flexibility when classes are not in session. 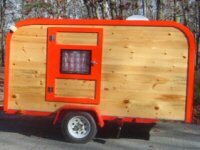 And so I have been thinking about resuming work on my trailer that has been in hibernation all winter. Brakes, Bearings, and Inspection scheduled for Thursday. Fingers crossed! !